Discover the sweet story of chocolate, from bitter bean to delicious dessert. Participants will investigate the raw ingredients, taste test different types of chocolate, and practice dipping fruits and snacks into melted chocolate to make treats enjoyable. Weekend Family Classes bring adults and children together to explore cool things about how plants connect science, art, history and culture. Each program includes a variety of hands-on activities and projects, as well as opportunities to bring the Garden home. Children are invited to enjoy nature-themed activities and stories on Monday mornings in the Lenhardt Library. Story time activities include songs, games, crafts and free play. Program is geared for children ages 2 to 5, accompanied by a caregiver. 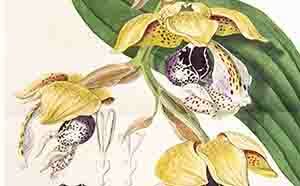 This rare book exhibition in the Lenhardt Library features beautifully hand-colored engravings of orchids found in tropical rainforests, cloud forests, and a particular orchid originally found in South America by botanical explorers Alexander von Humboldt (1769–1859) and Aime Bonpland (1773–1858) in 1834. Hours are from noon to 4 p.m. Wednesday through Sunday. Free library talks will be held on Thursday, February 21, at 2 p.m. and Sunday, March 10, at 2 p.m. The annual Super Seed Weekend returns, with a weekend full of how-to demonstrations and gardening information, ending with a lively Seed Swap on Sunday afternoon. Saturday focuses on fee-based classes and workshops, like Organic Vegetable Gardening Basics, Planning Your Garden for Seed Saving and a Seed Cleaning and Storing Workshop. Preregister for our free viewing of colorful seed catalogs in the Lenhardt Library’s Rare Book Collection on Saturday at 2 p.m. Sunday begins with the class Starting Seeds Indoors at 9 a.m. and continues with a lecture at 1:30 p.m. by Jovan Sage, Seed Savers Exchange board member. Jovan Sage is a creator, food alchemist, herbalist, grower, wellness coach and restauranteur through her Brunswick, Georgia, businesses, The Farmer and the Larder and Sage’s Larder. She’ll share her passion for the mission of Seed Savers Exchange and her community-based work. The swap takes place from 3 to 5 p.m., filling Burnstein Hall with enthusiastic seed swapping and advice sharing. Gardeners are invited to bring saved and leftover seeds to swap, though it’s not required. There will also be a family program, Loco for Cocoa, offered on Sunday. The Seed Swap is one of our most popular gardening events of the year, and a highlight of our winter calendar. Visit chicagobotanic.org/seedswap for more information. Stop by the Lenhardt Library to “borrow” seeds to plant, grow, harvest and save. At harvest time, save seeds for yourself, and return some to the Seed Library for others to “borrow” next season. With the borrowed seeds, you also receive resources on seed growing, harvesting, and saving. Hours are from noon to 4 p.m., Wednesday through Sunday. Come see 10,000 orchids in bloom and get a closer look at orchids in the tropics, where you will find the greatest diversity of orchid species on earth. This show will evoke the lush feel of rainforests, tropical islands, and warm beaches. As a nod to the importance of water in the tropics—rainforests can get hundreds of inches of rain a year—the Orchid Show features a “curtain” of falling water. The theme of water is implicit throughout, with seas of Vanda orchids, a banca canoe, and small islands blooming with tall palm trees and orchids. Trade the cold and gray of winter for a world that is infused with the warmth and light of turquoise seas. Enjoy musical events like Morning Music with Orchids on Tuesdays and Thursdays while surrounded by the beauty of the Orchid Show. Don’t miss Orchids After Hours on Thursdays—enjoy the orchids in the evening with tiki cocktails and light fare available for purchase. Partake in a cocktail tasting at Evening with Orchids on March 13 from 6 to 8 p.m.; separate ticket fee applies. An orchid marketplace takes place every Saturday and Sunday. A special Illinois Orchid Society Show & Sale is on March 9 and 10. Tickets for the Orchid Show are as follows: Adults $12 nonmember/$10 member; children (3–12 years) and seniors (62 years and up) $10 nonmember/$8 member; children under 3 are free. Regular hours are from 10 a.m. to 4 p.m. Open until 8 p.m. on Thursdays; closes at 3 p.m. on March 20. Visit chicagobotanic.org/orchid for more information. Members get early access to the Orchid Show, from 5 to 7:30 p.m., plus music, light refreshments, and a cash bar. Fees apply. Drop your kids (ages 5 to 10) at the ITW Kitchen where they will prepare a meal together, decorate a pot to start their own kitchen garden, and explore the Grunsfeld Children’s Growing Garden at night. We’ll have them fed and ready for your bedtime routine when you pick them up at the end of your date night. Every weekend, orchids and orchid-inspired items are for sale. Experts from the Illinois Orchid Society also offer repotting services on select weekends. Discover treasures of the Rare Book Collection in the Lenhardt Library. There are more than 4,000 titles in the collection, including some that are more than 500 years old. Discover botanical treasures that will intrigue, inform, and delight. Preregistration is required. Each session is limited to 15 adults. Bundle up, get outside and go on a nature walk. Warm up by the fire afterward. Meet at the McDonald Woods Shelter for a guided, 40-minute trek. No reservations necessary. If the temperature is below 20 degrees Fahrenheit, we will post a cancellation notice on the Garden’s website. Many of our favorite cold sweet treats get their flavors from plants. Vanilla comes from an orchid and fruits grow on bushes, trees or vines. In this class, participants will put together (and taste!) some easy-to-make fruity treats like smoothies and flavored shaved ice and receive recipes to make at home. Weekend Family Classes bring adults and children together to explore cool things about how plants connect science, art, history and culture. Each program includes a variety of hands-on activities and projects, as well as opportunities to bring the Garden home. Enjoy free instrumental music by local musicians in Nichols Hall. Tropical-inspired light bites and tiki cocktails are for sale on Thursday nights, when the Orchid Show remains open until 8 p.m. This rare book exhibition in the Lenhardt Library features beautifully hand-colored engravings of orchids found in tropical rainforests, cloud forests, and a particular orchid originally found in South America by botanical explorers Alexander von Humboldt (1769–1859) and Aime Bonpland (1773–1858) in 1834. Hours are from noon to 4 p.m. Wednesday through Sunday. A free library talk will be held on Sunday, March 10, at 2 p.m.
Come see 10,000 orchids in bloom and get a closer look at orchids in the tropics, where you will find the greatest diversity of orchid species on earth. This show will evoke the lush feel of rainforests, tropical islands, and warm beaches. As a nod to the importance of water in the tropics—rainforests can get hundreds of inches of rain a year—the Orchid Show features a “curtain” of falling water. The theme of water is implicit throughout, with seas of Vanda orchids, a banca canoe, and small islands blooming with tall palm trees and orchids. Trade the cold and gray of winter for a world that is infused with the warmth and light of turquoise seas. Enjoy musical events like Morning Music with Orchids on Tuesdays and Thursdays while surrounded by the beauty of the Orchid Show. Don’t miss Orchids After Hours on Thursdays—enjoy the orchids in the evening with tropical inspired beverages and light fare available for purchase. Partake in a cocktail tasting at Evening with Orchids on March 13 from 6 to 8 p.m.; separate ticket fee applies. An orchid marketplace takes place every Saturday and Sunday. A special Illinois Orchid Society Show & Sale is on March 9 and 10. Regular hours are from 10 a.m. to 4 p.m. Open until 8 p.m. on Thursdays. Tickets for the Orchid Show are as follows: Adults $12 nonmember/$10 member; children (3–12 years) and seniors (62 years and up) $10 nonmember/$8 member; children under 3 are free. Regular hours are from 10 a.m. to 4 p.m. Open until 8 p.m. on Thursdays; closes at 3 p.m. on March 20. Visit chicagobotanic.org/orchid for more information. Your next homemade breakfast won’t be the same after you learn how fun and easy it is to make your own butter. What better way to enjoy your butter than by spreading it onto delicious buttermilk pancakes? Participants will learn about the plants used to make breakfast and take home recipes to replicate this delectable feast. Weekend Family Classes bring adults and children together to explore cool things about how plants connect science, art, history and culture. Each program includes a variety of hands-on activities and projects, as well as opportunities to bring the Garden home. Displays of orchids from the rarest of species to cultivated hybrids will be artistically arranged and vendors will have orchids for sale. Come join the Illinois Orchid Society at its spring show and sale. Individual orchids in 128 classes will vie for ribbons. Entries will receive "best of class" green ribbons, and the best-appointed plant in the show will receive the Chicago Horticultural Society Award from the American Orchid Society judges. Displays of orchids will be artistically arranged, and repotting services will be available. Families can take part in orchid-based activities for children. Vendors will also be on-site to sell orchid plants and related products—cut flowers, cultural books, hobby bags of our special Illinois Orchid Society (IOS) potting mix, raffle tickets, and best of all, IOS memberships. Unwind with an evening viewing of the Orchid Show and enjoy tastings of local spirits and specialty cocktails. Light fare is available for purchase. Fees apply. Pizza has lots of ingredients from the garden—tomatoes, wheat, herbs and all the vegetables you can put on top. Learn how these plants grow and how they are used to make pizza. Participants will plant their own herb garden to take home. Weekend Family Classes bring adults and children together to explore cool things about how plants connect science, art, history and culture. Each program includes a variety of hands-on activities and projects, as well as opportunities to bring the Garden home. The Lenhardt Library hosts a book discussion group on Honeybee Hotel by Leslie Day from 6:30 to 8 p.m. on Tuesday, March 19. Space is limited; visit chicagobotanic.org/events/featured_events/one_book_one_garden to register in advance. Explore the world of this beautiful indoor plant family, which includes lipstick plant, primrose, and African violets. Explore the world of this beautiful indoor plant family, which includes lipstick plant, primrose, and African violets. The show features rare plants, artistic and educational entries, and a sale offering growing supplies and many unusual and difficult-to-find varieties. Learn about and enjoy the beauty of gesneriads, their diversity in flower and foliage, and their ease of culture. It’s no wonder that this family includes some of the most popular houseplants. There will be free demonstrations throughout the show on propagation, characteristics, and soil among other topics. Children in grades K – 5 will participate in high-quality learning activities with experienced teachers who use inquiry-based, hands-on activities. Programming connects nature to a range of themes including art, cuisine, and conservation. This spring, children will dissect and plant seeds, explore fragrant herbs and flowers, search for birds and early spring plants on nature hikes, take a trolley ride around the Garden, create take-home science-themed projects, and much more. Keep an eye out for your favorite orchids from the Show and take them home. Garden Plus members get early access, from 10 a.m. to noon. All members are welcome from noon to 2 p.m., and the general public is invited from 2 to 4 p.m., while supplies last. Please check our website and social media for updates; this event sells out quickly. This rare book exhibition in the Lenhardt Library features beautiful illustrations of plants known for their spices. Hours are from noon to 4 p.m. Wednesday through Sunday. Free library talks will be held on Thursday, April 11, at 2 p.m. and on Sunday, May 5, at 2 p.m. The Midwest Fruit Explorers presents this hands-on workshop with step-by-step instructions on how to graft and care for fruit trees. The best varieties for the Midwest will be available, including apple, pear, and plum trees. MidFEX members will be on hand to guide visitors to select the right tree for the right location. After purchasing root stock, visitors can follow the demonstration and leave with one or more trees ready to plant in the ground. No preregistration is required. This rare book exhibition in the Lenhardt Library features beautiful illustrations of plants known for their spices. Hours are from noon to 4 p.m. Wednesday through Sunday. Free library talks will be held on Thursday, April 11, at 2 p.m. and Sunday, May 5, at 2 p.m. Participants will make personalized oven-baked granola and a no-bake granola treat. Create a yogurt parfait to sample the tasty creation in class. This class is nut-free. Weekend Family Classes bring adults and children together to explore cool things about how plants connect science, art, history and culture. Each program includes a variety of hands-on activities and projects, as well as opportunities to bring the Garden home. In celebration of National Poetry Month, join award-winning local poet cin salach for an afternoon in the Greenhouses, walking, listening, and inviting spring with poetry inspired by nature. Meet in the East Greenhouse Gallery for the 45-minute walk followed by poetry writing exercises, materials, and guidance from the poet. The Unearth Science festival opens for adults to geek out on science in a fun atmosphere with themed drinks and food available for purchase. Attendees can mix their own scientific potion, grab a bite to eat, and mingle with Garden scientists. Day-of tickets are $13; Advance tickets are $11; members save $2 off each ticket. Usual parking fees apply. Children can cultivate their curiosity about science and gain a greater appreciation for the wonders of our planet during the second annual Unearth Science festival. The two-day event celebrates science and nature in ways that encourage exploration with more than 40 hands-on activities geared towards children ages 7 to 12. This year’s festival will include activities that facilitate learning about the plant life cycle, and how important connections are made between flowers and pollinators, resulting in fruits and seeds.Feature learning opportunities include an interactive pollinator challenge, dissecting a coneflower, and constructing an art installation that will serve as a home for native bees. The Unearth Science festival is free; regular parking fees apply. Registration is required for some programs. Visit chicagobotanic.org/sciencefestival for more information. Encourage your children to explore new foods and eat their fruits and veggies while having fun at Books and Cooks classes. The program is a one-hour caregiver-and-child class designed for older preschool children or kindergarteners ages 4 – 5. The class includes story time, games and a cooking activity. Topics include veggies and dip, banana nice cream, fruit salad, and rainbow soup. Visit chicagobotanic.org/family_programs/books_and_cooks for more information. Celebrate spring and enjoy a festive brunch buffet and festivities for the whole family at the Easter Egg Brunch. Bring a basket, because the hunt begins after brunch. Hop to the Rose Garden lawn and join in the Easter egg hunt before taking a stroll to explore the vibrant colors and spring blooms. Guests with reservations receive free parking. Learn about spring celebrations in Japan during this special weekend of activities. Listen to koto harp and shakuhachi flute music, suminigashi and watch a tea ceremony. The first 50 visitors who would like to take part in a tea tasting can do so after the ceremony demonstration. Kids of all ages can make projects to celebrate the traditional Girls' Day and Boys' Day—design a kimono-clad paper doll, create a hanging scroll, koimobori (miniature carp kites) and more at family-friendly, hands-on stations. Hours are 10 a.m. to 3 p.m. The schedule includes: members of the Urasenke Chicago Association tea ceremony at 10:30 a.m. and tea tasting at 11 a.m.; Pam Martinez teaching suminigashi (making marbled paper) from noon – 2 p.m..; Michael Gould playing shakuhachi flute at 1 p.m.; Chicago Koto Group playing koto harp at 2 p.m.
Volunteer Joanne Schmitz identifies spring wildflowers in bloom and talks about the “whys” of their ephemeral presence in the woods. How the woods have changed through the Chicago Botanic Garden’s history and the restoration efforts currently underway will also be part of this informative and timely walk in honor of Earth Day. The Midwest Daffodil Society's show features hundreds of daffodils on display that will be judged by the society. The Midwest Daffodil Society's show features hundreds of daffodils on display that will be judged by the society. The show includes cut blooms and floral design competitions. The show will include floral designs inspired by the gardens at the Chicago Botanic Garden. Daffodil growers of all skill levels are invited to participate. This rare book exhibition in the Lenhardt Library features beautiful illustrations of plants known for their spices. Hours are from noon to 4 p.m., Wednesday through Sunday. A free library talk will be held on Sunday, May 5, at 2 p.m.
Inspiring Nature Play is an annual conference geared toward enabling access to developmentally appropriate nature play experiences for an early childhood audience (birth through age 8). Keynote speakers will be Marilyn Brink and Jennifer Rosinia, addressing nature play and brain development. Attendees of the conference include approximately 200 formal and informal educators, administrators, and parents with a wide range of both early childhood and environmental education backgrounds and expertise. Inspiring Nature Play is possible because of the collaborative effort between Chicago Botanic Garden, the Alliance for Early Childhood, BackYard Nature Center, Greeley Elementary School, Forest Preserves of Cook County, Lincoln Park Zoo, Natural Start Alliance (a project of the North American Association for Environmental Education), and Northfield Community Nursery School. Visit chicagobotanic.org/teacher_programs/inspiring_nature_play_innovations for more information. Central States Dahlia Society Dahlia Sale – Saturday, May 4, and Sunday, May 5, 10 a.m. to 4:30 p.m. The Central States Dahlia Society holds its annual dahlia sale, which features dahlia tubers and plants in a wide array of sizes, shapes, and colors. The Central States Dahlia Society presents its annual plant and root sale in the Regenstein Center. The sale features dahlias in an array of sizes, shapes, and colors. This is a great opportunity to purchase dahlias seen on display at the society’s annual show in September. Society members will be available to answer questions and provide written information about dahlia planting and care. World Bonsai Day was created in 2010 to promote bonsai and friendship throughout the world. Bonsai curator Chris Baker and bonsai volunteers demonstrate bonsai tree styling. Jack Sustic, former bonsai curator (retired) at the National Bonsai & Penjing Museum (at the United States National Arboretum), leads demonstrations with Chris Baker. Demonstrations take place in Nichols Hall. At 1:30 p.m., Baker leads a Bonsai Collection Highlights tour. Spring-blooming highlights in the Bonsai Collection may include wisteria, crabapple and azalea. Meet in Runnells Courtyard for the tour. The Midwest Bonsai Society’s spring show features spring-blooming trees, bonsai on rocks, and suiseki (the Japanese art of stones). Visitors can also enjoy demonstrations and workshops and shop for bonsai and bonsai supplies. Registration is required for workshops. The 7,500-square-foot Model Railroad Garden is celebrating 20 years as a family-favorite exhibition featuring 18 trains running on 1,600 feet of track. The trains travel more than 22,000 miles each season and are 1/29th the size of life-size trains. Train and garden enthusiasts, young and old, return year after year for the delightful sights and sounds of the miniature trains traversing high and low through tunnels, across bridges, and around close to 50 American landmarks. All are intricately handcrafted with natural materials, including twigs, bark, leaves, acorns and pebbles. More than 5,000 tiny trees, shrubs, ground covers and flowering plants of close to 300 varieties re-create the topographical landscape of America. Vignettes of tiny people and animals give the exhibit a storybook feel, while sound effects and a working geyser capture visitors’ imaginations. Admission fees apply. Strollers are not permitted in the exhibition; however, stroller parking is located near the entrance. Visit chicagobotanic.org/railroad for more information. Volunteers stationed at discovery carts and throughout specific gardens (Buehler Enabling, Regenstein Fruit & Vegetable, Malott Japanese, and English Walled) offer information and hands-on experiences on a variety of topics through Discovery Programs. Hours are from 11 a.m. to 3 p.m. Wednesday through Friday; and 11 a.m. to 4 p.m. Saturday and Sunday. In the Regenstein Fruit & Vegetable Garden, topics will include herbs, composting, edible flowers, beneficial insects, tomatoes, watering, container gardening, attracting pollinators to the garden, tools, seed saving, microgreens and bees. Volunteers in the Malott Japanese Garden will share features of landscape design, talk about the Shoin House (which was modeled on a Japanese feudal lord’s retreat during the Edo Period, from 1603 to 1867), explain dry garden and raking techniques, and discuss the garden’s history and design. In the Enabling Garden, volunteers will demonstrate the advantages of a universal design garden while performing maintenance tasks. The Tool Shed, a resource center staffed by volunteers who answer questions and demonstrate tools that make gardening easier for people of all abilities, will also be open. Volunteers in the English Walled Garden will compare the garden’s design in six distinct interior "rooms," identify signature plants in each area, and discuss the garden’s history and design. The Woman’s Board of the Chicago Horticultural Society presents this plant sale with thousands of plants cultivated from nurseries and botanical institutions from across the country. A highlight of the sale is the “potted paradise” with composed planters grown on-site and designed by our own staff and Woman’s Board members. Plant Sale hours on Friday are from 10 to 11 a.m. for President’s Circle members and above; 11 a.m. to noon for Director’s Circle and above, and from noon to 4 p.m. for all members. Public hours are from 10 a.m. to 4 p.m. on Saturday, May 18. The most commonly known pollinators, bees and butterflies, are very important to the needs of all life forms and the planet as a whole. This exhibition aims to draw more attention to lesser-known and equally valuable pollination stories through interactive elements, videos, illustrations and specimens. The Rose Terrace Beer Garden is a perfect place to relax and sip a beer or glass of wine and have a light bite. Craft beers from Wisconsin, Michigan, and Illinois breweries are featured at the beer garden. Four to six beers are available on tap, along with a dozen varieties in cans or bottles. The menu includes freshly prepared snacks, appetizers, sandwiches, and salads. Ice cream is available in the Garden View Café. TrueJuice at the Fruit & Vegetable Garden is a perfect place to grab a freshly made smoothie or cold pressed juice. The Garden is partnering with TrueJuice to bring their concept and offerings to the Garden at the Fruit & Vegetable Garden. Using only pure ingredients, with no sugars or artificial flavors, TrueJuice products make it easier to consume more of the natural nutrients from fruits or vegetables. TrueJuice will be using some produce from Windy City Harvest to make their product here. Some of that produce may have been harvested right here at the Regenstein Fruit & Vegetable Garden. TrueJuice at the Fruit & Vegetable Garden will also be open on Mondays of Memorial Day and Labor Day weekends. Butterflies & Blooms is a butterfly exhibition where visitors can immerse themselves in a habitat filled with hundreds of live butterflies. This exhibition is filled with species native to South America, Asia, North America and Africa, as well as those native to North America. The 2,800-square-foot mesh enclosure is located on the Regenstein Learning Campus. Visitors can also observe butterflies emerging through a window into the pupa emergence room. Hours are 10 a.m. to 5 p.m. daily, weather permitting (last ticket sold at 4:30 p.m.). Visit chicagobotanic.org/butterflies for tickets and information. Learn to cook with garden-fresh ingredients all summer long at the Garden Chef Series. Noted chefs prepare recipes in the Regenstein Fruit & Vegetable Garden’s open-air amphitheater. Seating is first-come, first-served for these free demonstrations. Presented by the Northshore Iris & Daylily Society, the show features more than ten artistic arrangements and 75 irises in bloom. Irises and daylilies will also be available for purchase. Display is only on Sunday. This rare book exhibition in the Lenhardt Library features beautiful illustrations of plants known for their spices. Hours are from noon to 4 p.m. Wednesday through Sunday. Butterflies & Blooms is a butterfly exhibition where visitors can immerse themselves in a habitat filled with hundreds of live butterflies. This exhibition is filled with species native to South America, Asia, North America and Africa, as well as those native to North America. The 2,800-square-foot mesh enclosure is located on the Regenstein Learning Campus. Visitors can also observe butterflies emerging through a window into the pupa emergence room. Hours are 10 a.m. to 5 p.m. daily, weather permitting (last ticket sold at 4:30 p.m.) Visit chicagobotanic.org/butterflies for tickets and information. Learn to cook with garden-fresh ingredients all summer long. Noted chefs prepare recipes in the Regenstein Fruit & Vegetable Garden’s open-air amphitheater. Seating is first-come, first-served for these free demonstrations. Demonstrations begin at 1:30 and 2:30 p.m. Bees & Beyond is a Garden-wide thematic program that will inspire a genuine appreciation for the vital role pollinators play in our everyday lives and in a healthy, diverse planet. The topic of pollinators aligns perfectly with the Chicago Botanic Garden’s mission: We cultivate the power of plants to sustain and enrich life. The subject matter is timely—there is an urgency to protect pollinators while we still can—and timeless: pollinators are fundamentally connected to plants and, therefore, life. Bees & Beyond will also define concrete ways for visitors to protect pollinators. The main emphasis of the program is from June through September, 2019, with touchpoints throughout the year. Visit https://www.chicagobotanic.org/beesandbeyond for more information. TrueJuice at the Fruit & Vegetable Garden is a perfect place to grab a freshly made smoothie or cold pressed juice. The Garden is partnering with TrueJuice to bring their concept and offerings to the Garden at the Fruit & Vegetable Garden. Using only pure ingredients, with no sugars or artificial flavors, TrueJuice products make it easier to consume more of the natural nutrients from fruits or vegetables. TrueJuice will be using some produce from Windy City Harvest to make their product here. Some of that produce may have been harvested right here at the Regenstein Fruit & Vegetable Garden. Visit the Lenhardt Library this summer to read, play and earn prizes. This program was developed to encourage the joy of reading and literary skills and help reluctant readers enjoy nature STEM activities to develop critical thinking skills. Research has shown that reading 20 minutes per day (or 300 minutes per summer) reduces the “summer slide” and enables students to maintain their reading level during summer vacation. Sign up at the Lenhardt Library and receive a reading and activity log to record your child’s progress. Hours are from noon to 4 p.m. Wednesday through Sunday. Visit chicagobotanic.org/library/summer_reading for more information. The show includes a cut-leaf display of various shapes, sizes, and colors of hosta grown in the Midwest. The Northern Illinois Hosta Society presents this show, which features more than 100 cut-leaf specimens of hosta, including rare and unusual varieties. Hosta growers will have garden-ready plants for sale. Join us for hands-on activities in the Nature Play Garden. Program themes include nature play activities focused on loose parts; self-directed tools to enhance engagement with the Nature Play Garden; and guided games, story time and nature walks. Activities vary from week to week. During inclement weather, activities will move to the Astellas Atrium. Drop by the Elizabeth Hubert Malott Japanese Garden for hands-on activities related to Japanese arts and culture. Each Sunday features a different take-home project as well as books and hands-on activities, including using chopsticks, raking miniature dry gardens, practicing calligraphy, and more. The take-home activities vary each time and are subject to change. Enjoy an enchanting one-hour musical performance of carillon bells on a warm summer evening and watch lights illuminate Evening Island. Through a regularly scheduled series of concerts each summer, carillonneurs from around the world delight Garden visitors with the captivating music of the 48-bell Theodore C. Butz Memorial Carillon. Meet the performers and enjoy a free carillon tour and demonstration before the concert. Since 1986, the carillon has remained both a noted landmark and a source of remarkable music at the Garden. Crafted in Holland, the tower’s bronze bells and playing device with a range of four octaves constitutes one of the few hand-played carillons in the nation. Preconcert carillon tours and demonstrations from 5:30 to 6:30 p.m. (every 15 minutes). Concerts begin at 7 p.m.
Each Tuesday morning brings a different kind of music, from rare string instruments to a harp quartet, to McGinley Pavilion. Overlook Evening Island while you enjoy an hour-long, meditative musical performance. As part of Summer Evenings at the Garden, each Tuesday evening brings a different kind of music to the Esplanade. Bring a picnic and unwind after the work day with free live music while watching the sun set over the Smith Fountain. Please note: You are encouraged to bring your own chairs as the Garden has a limited supply available each evening. Dancin' Sprouts provides free musical entertainment for kids in the Rose Garden. Bring the whole family and enjoy live music in this idyllic summer setting. Please Note: You are encouraged to bring your own chairs as the Garden has a limited supply available each evening. Bring your dancing friends and kick it up a notch with high-energy music as you dance (or listen) to the upbeat tempo of a host of diverse genres in McGinley Pavilion. Please note: You are encouraged to bring your own chairs as the Garden has a limited supply available each evening. This rare book exhibition in the Lenhardt Library features beautiful illustrations of butterflies, bees, and other pollinators. Hours are from noon to 4 p.m., Wednesday through Sunday. Free library talks will be held on Sunday, June 23, at 2 p.m., Thursday, July 18 at 2 p.m., and on Thursday, August 15, at 2 p.m. Creatures of the Cove (Free Family Friendly Cove Weekends) – Saturdays and Sundays, June 8 & 9, July 13 & 14, and August 10 & 11, 10 a.m. – 4 p.m. There will be three special weekends during the summer when the Kleinman Family Cove will be open for free wading exploration. Bring your boots and learn about the plants and animals that depend on our waterways. Camp CBG provides children ages 6 months to 12 years with exciting and enriching learning experiences. The Garden offers weeklong camps with morning, afternoon, and all-day options (one and two weeks) from June 17 to August 16. The majority of the camp day is spent outside, weather permitting. Online registration begins in January. Visit chicagobotanic.org/camp for more information. The Board of Directors of the Chicago Horticultural Society will present the Summer Dinner Dance on Friday, June 21, on the Summer Solstice. The cocktail party begins in the Crescent Garden and Heritage Garden with appetizers and specialty cocktails. Dinner will be catered by Food for Thought in a tent on the enchanting Esplanade. Lettuce grown by Windy City Harvest, the Garden’s urban agriculture program, will be incorporated into the meal. The inside of the tent will be designed by Revel Décor with tablescapes featuring summer flowers that are attractive to pollinators. Guests will dance the night away to the music of Maggie Speaks. Proceeds from this event will continue to connect people to science, conservation, and nature. Tickets begin at $750. Call (847) 835-6958 for tickets and visit https://www.chicagobotanic.org/donate/summer_dinner_dance for more information. This rare book exhibition in the Lenhardt Library features beautiful illustrations of butterflies, bees, and other pollinators. Hours are from noon to 4 p.m., Wednesday through Sunday. Free library talks will be held on Thursday, July 18, at 2 p.m., and on Thursday, August 15, at 2 p.m. The 7,500-square-foot Model Railroad Garden is celebrating 20 years as a family-favorite exhibition featuring 18 trains running on 1,600 feet of track. The trains travel more than 22,000 miles each season and are 1/29th the size of life-size trains. Train and garden enthusiasts young and old return year after year for the delightful sights and sounds of the miniature trains traversing high and low through tunnels, across bridges, and around close to 50 American landmarks. All are intricately handcrafted with natural materials, including twigs, bark, leaves, acorns and pebbles. More than 5,000 tiny trees, shrubs, ground covers and flowering plants of close to 300 varieties re-create the topographical landscape of America. Vignettes of tiny people and animals give the exhibit a storybook feel, while sound effects and a working geyser capture visitors’ imaginations. Admission fees apply. Strollers are not permitted in the exhibition; however, stroller parking is located near the entrance. Visit chicagobotanic.org/railroad for more information. Stroll and shop among more than 90 juried artists on the Esplanade. This one-of-a-kind art festival brings botanic-themed and botanic-made photography, paintings, ceramics, cement, metal, fiber, wood, jewelry, and other pieces to the Chicago Botanic Garden. Find remarkable items to purchase or just admire them during your visit to this annual event. Visit chicagobotanic.org/artfestival for more information. Beautiful, judged display of more than 100 lily blooms in different varieties. The Wisconsin-Illinois Lily Society's annual show features floral arrangements in four artistic categories, and a beautiful, judged display of more than 100 lily blooms in different varieties. This show features true lilies, belonging to the genus Lilium. There are about 80 different species of lilies, and thousands of hybrids. Visitors can get tips from experts on how to grow and propagate lilies. Creatures of the Cove (Free Family Friendly Cove Weekends) – Saturdays and Sundays, July 13 & 14, and August 10 & 11, 10 a.m. – 4 p.m. The Bromeliad Society of Greater Chicago show and sale features plants such as pineapple and Spanish moss, which are generally easy to grow, require little care, and reward the grower with brilliant, long-lasting blooms and ornamental foliage. Society members will be on hand; information on growing bromeliads will be provided. Various bromeliads will be for sale. *This event will take place in conjunction with the Iris and Daylily Society Daylily Show & Sale. Presented by the Northshore Iris and Daylily Society, this show features more than ten artistic arrangements and more than 50 daylily varieties in bloom. The sale features iris and daylily plants, available for purchase on both Saturday and Sunday. The show is on Sunday only. Adventurous diners will not want to miss out on Farm Dinners at the Chicago Botanic Garden, celebrating the connection between midwestern farmland and the locally grown food we love to eat. Enjoy a spectacular meal prepared with locally grown ingredients by award-winning chef Cleetus Friedman. Guests will be joined by the Garden’s own Windy City Harvest Youth Farm staff and participants and makers of wine, beer and spirits. Guests will enjoy cocktails and a tour of the Regenstein Fruit & Vegetable Garden, followed by a unique dining experience under the grape arbor where they will converse with their table mates while learning more about the food and beverages being served. Cost is $220 per person. Visit chicagobotanic.org/farmdinners for details. The Cactus and Succulent Society of Greater Chicago presents a show and sale, featuring plants grown by members of the society. Displays, demonstrations, tours, vendors, and chef demonstrations showcase a variety of garden herbs at the Regenstein Fruit & Vegetable Garden that visitors can grow in their own gardens. Visit chicagobotanic.org/calendar/event/herb_garden_weekend for a full schedule of the weekend. The Ikebana International Society presents an exhibition of traditional Japanese flower arranging. This event features many educational opportunities to learn about the mechanics and techniques of ikebana. This rare book exhibition in the Lenhardt Library features beautiful illustrations of butterflies, bees, and other pollinators. Hours are from noon to 4 p.m. Wednesday through Sunday. A free library talk will be held on Thursday, August 15, at 2 p.m. The standard flower show includes tabletop arrangements, floral designs, educational exhibits, photography, artistic crafts, youth exhibits, and of course, horticulture exhibits. Garden Clubs of Illinois is comprised of nearly 10,000 members and is divided up into nine districts. Creatures of the Cove (Free, Family-Friendly Cove Weekends) – Saturdays and Sundays, August 10 & 11, 10 a.m. – 4 p.m. The 14th annual Kite Festival returns to the Garden. Enjoy soaring stunt-kite performances set to music. The Kite Festival will take place in the meadow west of Evening Island, weather permitting. Visitors can walk there or take a free tram. Ice cream treats, beverages, and many lunch options will be available for purchase on-site. Enjoy soaring stunt-kite performances set to music by the members of the Chicago Fire Kite Team and members of the Kite Society of Wisconsin & Illinois. These high-flying professionals demonstrate awesome feats of beauty and great skill. The Chicago Fire Kite Team has been competing and demonstrating team sport kite ballet and precision since 1986. Invited to kite festivals around the world, they have flown in front of friendly crowds in England, France, Japan, Canada, and the United States. In addition to watching the professionals, feel free to bring your own kite to participate in public fly time, or make a kite to fly at the kite-making workshop. Sign up for the Kids’ Mad Dash. The first 30 kids to register will receive a kite to build and fly in the competition. Register in the Gift of Wings tent between 10 a.m. and 1 p.m. (or until registration is filled). The Gardeners of the North Shore host this annual show, which includes a judged exhibition with more than 500 entries of anything a home gardener can grow, such as flowers, vegetables, herbs, and houseplants. Some plants will be available for sale. Amateur gardeners are welcome to enter. Presented by the Midwest Bonsai Society, this show draws visitors from across the United States and is often regarded as one of the top three shows of its kind in the country. Enjoy a display of 200 bonsai trees reflecting all types of bonsai styles. Shop more than a dozen vendors for bonsai trees and supplies. Free demonstrations and lectures are available. Also, workshops will be held throughout the weekend for bonsai enthusiasts of all skill levels. Visit midwestbonsai.org for more information on workshops. Malott Japanese Garden Summer Festival – Saturday, August 17, and Sunday, August 18, 10 a.m. – 3 p.m. Learn about summer celebrations in Japan during this special weekend of activities. Listen to Koto harp and Taiko drum music, enjoy traditional folk tales, and watch a tea ceremony. Participate in free hands-on crafts for children of all ages, including uchiwa-paper fans, origami Samurai helmets, and gyotaku-fish prints. Ikebana, the Japanese art of flower arranging, originated with Ikenobo in Kyoto, Japan, as a Buddhist floral offering. Each day features two Reishke Ishke (flower arranging ceremony) and two tea ceremonies. This show is in Burnstein Hall and is presented by the Ikenobo Ikebana Society, Chicago Chapter. Learn how to grow and use heirloom tomatoes and other heirloom vegetables with displays, activities, tours, seed saving demonstrations and more. Take a Regenstein Fruit & Vegetable Garden tour with the staff horticulturist and learn how easy it is to save your own heirloom/open-pollinated tomato seeds. Select vendors will have a variety of items for sale. As part of the Garden Chef Series, a chef will give cooking demonstrations featuring recipes with heirloom ingredients on both days. Visit chicagobotanic.org/calendar/event/heirloom_tomato_weekend for more information. This rare book exhibition in the Lenhardt Library features beautiful illustrations of butterflies, bees, and other pollinators. Hours are from noon to 4 p.m., Wednesday through Sunday. The Illinois Mycological Association celebrates the richness of fall mushrooms in Illinois with an exhibition of 50-100 varieties of mushroom foraged from area forests. Members provide information and answer questions about mushrooms and fungi. Explore the children’s education area and shop for mushrooms, books, T-shirts, and more at the show. Mycology is the study of fungi that explores how humans use them as a source for medicine and food; what dangers they may pose, such as poisoning or infection; and their benefits to natural ecosystems. The third annual Harvest Party will be held on the late summer grounds of the Chicago Botanic Garden. Tickets begin at $225. Call (847) 835-6958 for tickets and information. Hundreds of dahlia blooms ranging in size from a silver dollar to a dinner plate will be on display. What is it about dahlias that has attracted so many fans and admirers? Dahlias are known for their unique features, vibrant colors, perfect petal arrangements, and overall “wow” factor. Get ready for an explosive burst of color at the 86th annual Central States Dahlia Society Show at the Chicago Botanic Garden. More than 2,000 flowers in the dahlia family will be judged and on display in a wide variety of colors, sizes, and forms, with floral designs and photography completing the show. Society members will be on hand to provide written information and to answer questions about dahlias. This rare book exhibition in the Lenhardt Library features beautiful handcrafted artist boxes and objects, made from the wood of fallen trees at Bartram’s Garden, in combination with original poetry. This is a project of the Center for Art in Wood in Philadelphia. Hours are from noon to 4 p.m., Wednesday through Sunday. Free library talks will be held on Sunday, October 6, at 2 p.m. and Thursday, November 14, at 2 p.m.
A juried exhibition featuring over 140 artists selling handcrafted works in twelve media including baskets, ceramics, fiber decorative, fiber wearable, furniture, glass, jewelry, leather, and more. Hours are from 10 a.m. to 6 p.m. on Friday and Saturday and from 10 a.m. to 5 p.m. on Sunday. Tickets are required. Visit chicagobotanic.org/ace more information. Hold onto summer and shop for one-of-a-kind natural plant and dried flower arrangements at the Chicago Botanic Garden’s 35th Roadside Flower Sale. Visit the sale in Burnstein Hall for gifts incorporating dried flowers, pods, and grasses from the Garden. More than 300 flower arrangements and wreaths created by talented volunteers are available for purchase. The sale features arrangements, wreaths, bouquets, wall hangings, stationery cards, and more. Learn how to harvest, preserve, and store your homegrown produce or farmers’ market bounty during Harvest Weekend. Join us at the Regenstein Fruit & Vegetable Garden for “how-to” demonstrations, shopping from local vendors, Garden Chef Series presentations, a cookbook swap, and more. Visit chicagobotanic.org/calendar/event/harvest_weekend for more information. This rare book exhibition in the Lenhardt Library features beautiful handcrafted artist boxes and objects, made from the wood of fallen trees at Bartram’s Garden, in combination with original poetry. This is a project of the Center for Art in Wood out of Philadelphia. Hours are from noon to 4 p.m., Wednesday through Sunday. Free library talks will be held on Sunday, October 6, at 2 p.m. and on Thursday, November 14, at 2 p.m.
Buy bulbs to plant now, and your spring is guaranteed to be alive with color. More than 250 varieties of daffodils, tulips, crocus, and specialty bulbs tempt gardeners at the annual Bulb Sale. Buy mums, asters, peonies, potted amaryllis, paperwhite narcissus, and “Bulb Boost,” too. Expert staff are on hand to answer questions and offer tips. All proceeds benefit the Chicago Botanic Garden. The sale is presented by the Woman’s Board of the Chicago Horticultural Society. There’s live music; a harvest market; cider, wine, and beer to purchase; and the amazing gourd mountain for selfies. Many local vendors will offer baked goods, honey, roasted nuts, fresh jams, and much more. Welcome the fall season with a refreshing cold glass of beer. Oktoberfest celebrations happen throughout Europe; the Chicago Botanic Garden will celebrate locally. Guests check in at the McGinley Pavilion and receive a wristband, tasting glass, and tasting sheet. Breweries will pour a few different seasonally selected beers in 2-ounce tastings. Light fare, wine, hard cider, and featured beer by the bottle will be available for purchase. Come to drink in the best of the season. The Illinois Orchid Society presents this show, in which individual orchids in 128 classes will vie for red, white and blue ribbons. Twenty-five entries will receive “best of class” green ribbons, and the best-appointed plant in the show will receive the Chicago Horticultural Society Award from American Orchid Society judges. Tabletop displays, from the rarest of species to cultivated hybrids, will be artistically arranged in Burnstein Hall. The Society will provide an orchid sales area and repotting services. Visit iosoc.com for more information. Participants are invited to dress their dogs in Halloween costumes and bring them to the Garden for this one special day each year. The costume contest and a parade through the Garden will start in the Krasberg Rose Garden. More than 1,000 hand-carved, real pumpkins—some as large as 150 pounds—will light up the night. Using scalpels, knives, gouges, and power tools, artists from the New York-based company Rise of the Jack O’Lanterns spend up to 15 hours sculpting a single pumpkin. The LED-lit jack-o’-lanterns will be staged along a festive, paved pathway, starting at the Esplanade. Along the way, encounter entertaining characters, watch live carvers, and view the ghostly trains in the Model Railroad Garden: Landmarks of America. Visit chicagobotanic.org/halloween for tickets and information. The Midwest Daffodil Society’s bulb sale features many varieties of unique and east-to-grow daffodils for the gardener who wants some early color next spring. Freshly harvested fruit grown in the area by the Midwest Fruit Explorers is on display and for sale. Apples, pears, pawpaws, grapes, kiwis, and more are featured. See apples turned into cider during apple press demonstrations. Visitors can enjoy tastings and receive information on growing fruit. Apples, cider, and more will be available for sale. A wide variety of lily bulbs will be available for purchase at the Wisconsin-Illinois Lily’s Society’s annual sale. This rare book exhibition in the Lenhardt Library features beautiful handcrafted artist boxes and objects, made from the wood of fallen trees at Bartram’s Garden, in combination with original poetry. This is a project of the Center for Art in Wood in Philadelphia. Hours are from noon to 4 p.m., Wednesday through Sunday. A free library talk will be held on Thursday, November 14, at 2 p.m. Stunning quilts, lovely knitted artwear, woven wonders, and breathtaking beadwork are among the abundant handcrafted items on view and for sale during the Fine Art of Fiber, held at the Garden's Regenstein Center. The area's oldest, largest, and most unique fiber art event, the Fine Art of Fiber is hosted by Illinois Quilters, Inc., North Suburban NeedleArts Guild, and the Weavers Guild of the North Shore. A complimentary opening night, including early buying privileges, is from 6:30 to 9 p.m. Thursday evening. The Lenhardt Library hosts a book discussion group. Space is limited; visit chicagobotanic.org/events/featured_events/one_book_one_garden to register in advance. This rare book exhibition in the Lenhardt Library features beautiful handcrafted artist boxes and objects, made from the wood of fallen trees at Bartram’s Garden, in combination with original poetry. This is a project of the Center for Art in Wood in Philadelphia. Hours are from noon to 4 p.m., Wednesday through Sunday.